Crowd sourcing is defined as "for the act of taking tasks traditionally performed by an employee or contractor, and outsourcing them to a group crowd of people or community in the form of an open call." The key here is that the work has to be done by non-employees so a group of librarians from your institution working on a subject guide wiki would not be crowd sourcing, unless you opened the wiki for your users to add resources. Traditionally librarians have being suspicious of crowd sourcing, but this is slowly changing. Still there is an issue of "trust" involved. 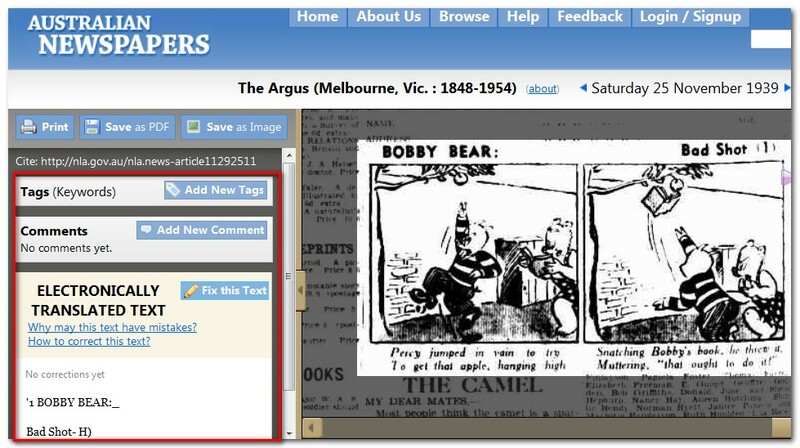 The Australian Newspapers Digitisation Program (ANDP) is responsible for digitising historic Australian newspapers from 1803 onwards to 1954 - the Historic Australian Newspapers archive. This in itself isn't unusual, what makes this project unique is that it has a mechanism in place to enlist the help of the public to correct errors in OCR (Optical Character Recognition). Users were also allowed to tag articles, which as the paper (pdf) states is a bit unusual for text where full-text search is available. In general the project seems to be a success, while many users initially did not expect to be able to do text correction, but once they figured it out many users found that text-correction was addictive, while others drew parallels to Wikipedia. 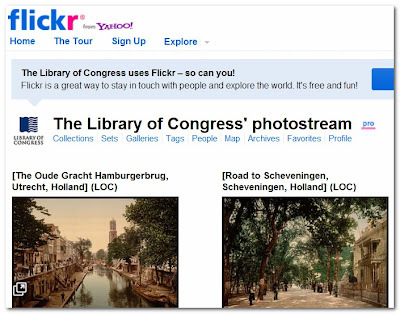 In Jan 2008, the Library of Congress began sharing two collections of historical photos on Flickr. 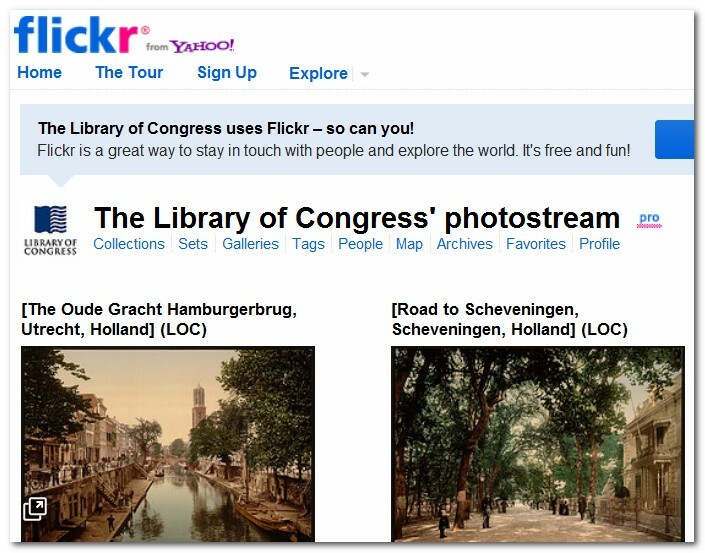 79% of the 4,615 photos have been made a “favorite” (i.e., are incorporated into personal Flickr collections). Looks like another success case of crowd sourcing. Today many libraries have deployed or are planning to deploy next-generation OPACS. Users are able to tag or rate items. Typically they are also allowed to contribute user reviews. There are too many libraries to list that have OPACS or discovery layers that provide such features, but generally I think they haven't taken off. Most probably because most institutions do not have the critical mass necessary for tagging to become useful. 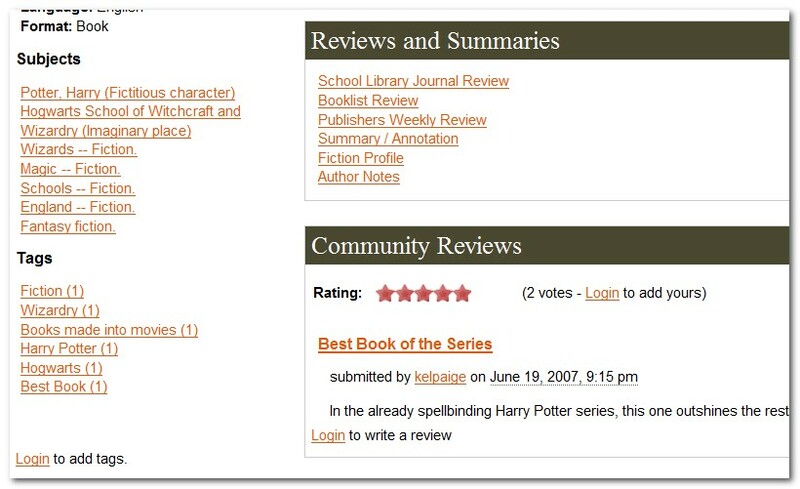 Below is an example of a Harry Potter book from being tagged, rated and reviewed by users from the Ann Arbor District Library SOPAC. "Free tagging in the Ann Arbor catalog as it pertains to the discovery of material is indeed a failure, simply because the data set hasn’t grown large enough to become terribly meaningful." "If you want to make the argument that local tags are representative of the local community, then I can understand–that was my original argument. But if a community like Ann Arbor cannot support a meaningful tagging system, I’m skeptical that many others would–maybe large metropolitan systems, but anything smaller? Probably not." As I write this, Singapore's National Libraries has just launched NLBSearchPlus (Primo I think), it will be interesting to see if they have enough critical mass for user contributed tags to take off. 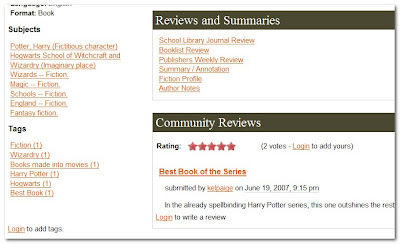 In comparison as John Blyberg notes LibraryThing for libraries are much more successful because you can seed your library OPAC with hundreds of thousands of reviews and tags. Currently over 160 libraries use this system. Items in the catalogue are matched using ISBN and can be inserted into any OPAC that accepts html. The information of course is drawn (filtered and curated) from LibraryThing which can be seen as a way to crowdsource cataloging and tagging. LibraryThing for libraries also provides recommendations (as do other recommender systems similar to Amazon's "users who bought this also bought ..." ), I wonder if that counts as crowd-sourcing recommendations. 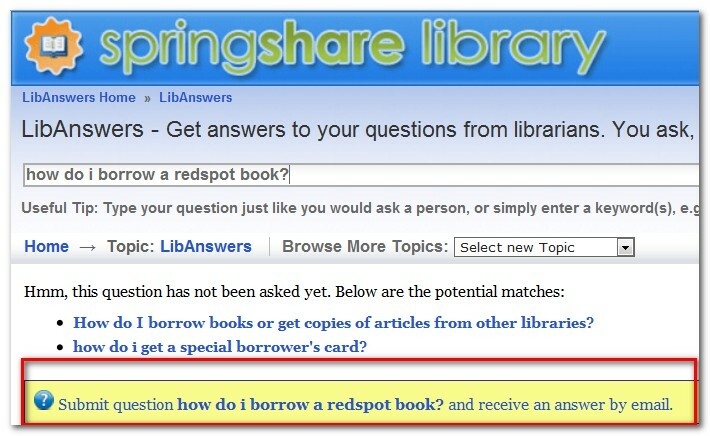 Frequently asked questions are often constructed based on librarians judgment on what are frequently asked. 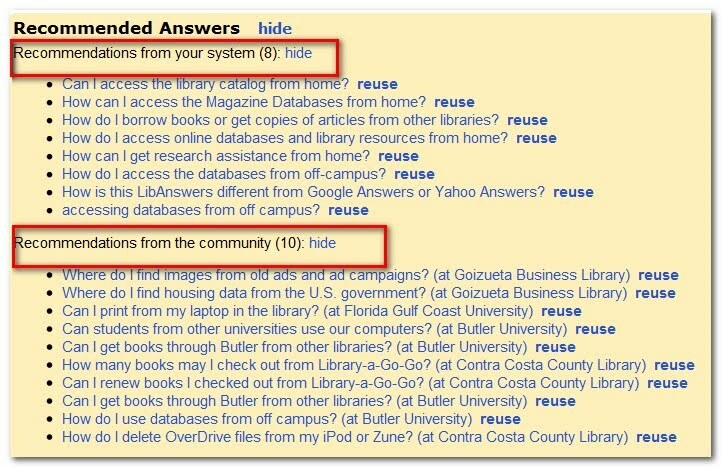 LibAnswers and similar Q&A/knowledgebase systems take the guess work out of this, by (1) listing results by most viewed, and (2) allowing users to post a question if it's not found in the FAQ. 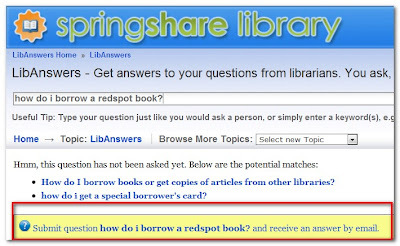 Librarians can then answer this question and post this automatically to the FAQ if desired. 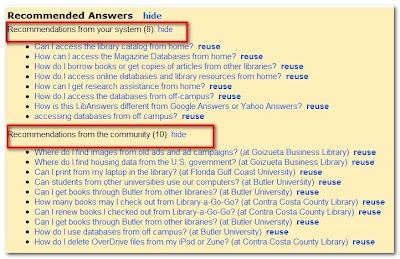 When the librarian answers the question, LibAnswers also lists related answers from other libraries on LibAnswers so in a sense you can to crowdsource answers as well. Currently this service which just started early 2009 is too new to be assessed. 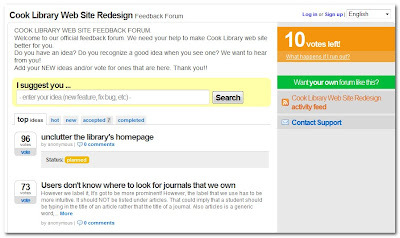 In feedback for libraries - Getsatisfaction, UserVoice, Yelp , I wrote about the use of crowd-sourcing tools such as GetSatisfaction and UserVoice to crowdsource feedback, ideas comments. 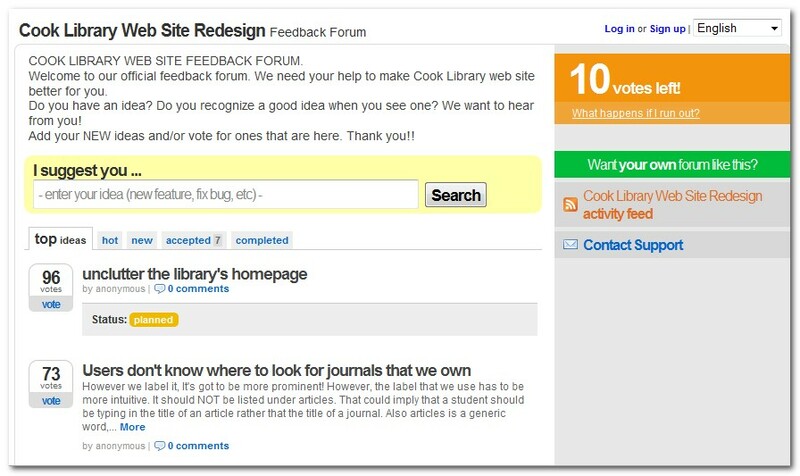 I reviewed some of the accounts again, most library accounts have not yet managed to achieve critical mass except for Cook Library's UserVoice page, which they used to get feedback for their website design. Collaborative Cataloguing isn't a particularly new idea, libraries have always shared cataloguing records to reduce the number of original cataloguing necessary. Typically such cataloguing efforts are open to only librarians, but new approaches allows the public to get involved. Librarything (Cataloging Flash mob), Biblios.net and Open Library are some example. Open Library in particular mimicks Wikipedia style pages that allows anyone to add or edit pages for each book. 7. What else can be crowd sourced? What else can be crowd-sourced? In theory subject guides done on wikis can be crowdsourced. But as seen by the listing of libraries wikis , the vast majority of wikis are edited only by librarians in the same institution. As far as I know, none allow users to edit. While the Librarywikis page listed Chad Boeninger of Ohio University Libraries' Biz wiki as one that allowed users to do so, a quick meebo chat with Chad cleared that up. He used to allow users to edit 2 years ago, but nobody edited except for spammers. I guess while users are fine with editing wikipedia, they still aren't comfortable with editing library subject pages for various reasons. Why are some crowd sourcing projects successful others aren't? Some of it is obviously due to the size of the user base, Library of Congress and the National Library of Australia obviously have larger user bases that other libraries, so their crowd sourcing projects have a better chance of taking off. There are other reasons, this article, which pretty much hit the head on the nail, advises that "Your workers are unpaid, so make it fun." This could be as simple as listing top performers, awarding titles or ranks for targets met, to making it into a game of some kind. Are there other crowd sourcing projects that libraries have engaged in that I have not mentioned? Another example is New Zealand Horowhenua library's Turst's Kete Horowhenua project: http://horowhenua.kete.net.nz/en/site. It is for users to contribute, tag and comment on photos, videos, documents, etc. Thanks for the compilation, very useful for me.